"It's curious how the universe works," says Roger Christian when TechRadar asked him how his passion project Black Angel and Star Wars have become so intrinsically linked over the past 35 years. The legendary production designer put together the very lightsaber that became not only one of the most iconic details of cinema's most famous world, but also a critical plot point in this year's eagerly awaited Star Wars: The Force Awakens. Christian, an Oscar winner in set design who has also served as a second unit director on Star Wars and directed big budget films himself spoke to us when he launched an Indiegogo to help fund a full-length version of Black Angel. The short of Black Angel was screened to people who went to cinemas to watch the Empire Strikes Back ahead of the film itself right back in 1980, beginning a journey that feels like it started a long time ago in a cinema galaxy far, far away. 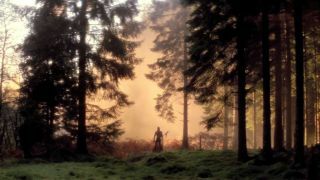 Curiously, despite being referenced as an influential work, the medieval themes that have become such a recent trend - think Game of Thrones and Peter Jackson's Tolkien films - were so out of fashion in the sci-fuelled post Star Wars landscape that the short faded into virtual obscurity, not least because the negative went missing. But, Christian's decision to finally write down his own version of working on some of the world's most famous films, sparked a burst in publicity that led to the rediscovery of the missing film in 2011 and put it back on the radar. "An archivist from Warner Bros rang me up after reading an interview and said: 'I've got your negative'. It was close to Christmas and it was the best present I've ever got," Christian told TechRadar. "But it was an old negative and I was just wondering what to do next when I got another call out of the blue offering to restore the film." A new burst of hype for Black Angel - a moody short that tracks a knight on a quest, - followed, buoyed by many who had first seen the film ahead of Empire Strikes Back, the second entry in the Star Wars original trilogy and one of the greatest science fiction films of all time. Echoing George Lucas' inspiration for Star Wars' Jedi Knights and an epic quest, Christian is clear about the influence that legendary filmmaker Akira Kurosawa had on his vision." "I was inspired by Kurosawa, and the idea of a lone samurai against evil," he says. "What I always intended to do was a film that had the mood of those Asian fantasy Kurosawa epics." The short arrived on YouTube this year, and is accompanied by an introduction from Christian that seems almost apologetic. Christian laughs when we put it to him that one of the team had described it as the most British thing he'd ever seen. "I was worried that reissuing a short film 35 years on could look like ego. What people remember from back then isn't necessarily accurate," he insists. "And we were using old ends of film stock from Empire Strikes Back, and doing everything ourselves so I couldn't really do exactly what was in my head." Somewhat refreshingly, Christian remains full of passion and enthusiasm for the Star Wars films that helped cement his place in film history, and is completely open about how much Lucas' success has played a part in Black Angel's reappearance and now a move to a full length feature being pushed in a year with a new Star Wars. "[The hype around the new Star Wars film] has been a really good thing," he tells us. "I honestly think it's why I'm getting to make my passion project.